In college I didn’t do too much cooking. Looking back, I really can’t believe that this foodie didn’t even know how to cook more than a bowl of spaghetti and meat sauce. In fact, I didn’t really start experimenting in the kitchen until we got married and I found myself with a fully stocked kitchen after our wedding. My mom always said a way to a man’s heart is through his stomach. I quickly began watching cooking shows, and found the true joy of cooking and baking from scratch. 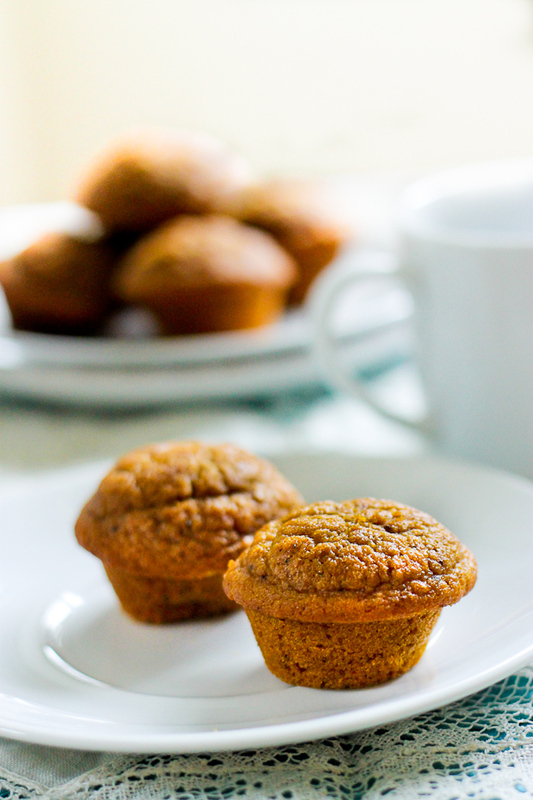 Back then I was not afraid to bake, and these pumpkin muffins were one of the few recipes that I prepared in my college kitchen. They may or may not have been little more decadent in their past life, but I’ve since learned how modify a recipe and use better for you ingredients. Good thing! 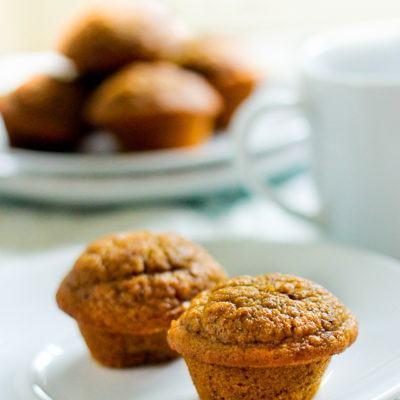 These healthy pumpkin muffins do not disappoint, and they sure don’t taste healthy. If you are a pumpkin fan, give these muffins a whirl. Question: Did you cook and eat healthy in college? In bowl of stand mixer, or large bowl with wooden spoon, mix pumpkin, eggs, oil, applesauce, water and vanilla until combined. Stir in sugars. In separate bowl, whisk together flours, salt, baking soda, and pumpkin pie spice. Pour flour into wet ingredients, and mix just until combined, making sure not to over mix. Coat mini muffin tin with cooking spray or butter, and fill cups full with batter. Bake for 18 minutes or until toothpick inserted in center of muffin comes out clean. …just made these tonight. super delish! i don’t see a button to print the recipe though…? thanks for your message Heather! I will update this recipe to make it “printable”. Sorry about that. Could I use w w flour I’d I don’t have we pastry? I have oat flour and spelt flour too. Thanks! Absolutely! You can for sure sub in whole wheat flour. The pastry flour is a little softer. Spelt might work great as well. Just made these and they are amazing! Thank you for this delicious recipe! WIN! Pumped you liked them! Is there a way for me to cut down the sugar in this recipe? Will using 1/2 cup of brown sugar work just fine? Thank you! That might work! If you try it and I'd love to know how it turns out. I cut the sugar way down from the recipe I used in college.. Haha! Wh you say pumpkin do you mean like Libby's in a can? How many calories are in each one? Hey Lisa! I added the nutrition facts per muffin to the post 🙂 ENJOY! Oh that's a good question. I'd bake them for 20-25 minutes and then stick a toothpick in the middle to test if it's clean. I've used this recipe with other sizes (regular and loaf) and just bake until they have risen are golden brown and the toothpick is clean. Despite my kids turning off the oven shortly after we put them in the oven, these muffins still turned out! They are moist, not dense, and very tasty. I pulverized whole oats in a food processor to make my own oat flour. Now I'm off to check out the other recipes on this site. Thank you! Thank you for leaving your comments! I'm thrilled that you and your kids enjoyed them! Looks yummy! It feels like I am getting the smell when I am watching the photos! This looks delicious! And the fact that you say it tastes just like Starbucks makes it very tempting to make!